The NITI Aayog has assured all possible assistance for development of eastern Nagaland as committed by Prime Minister Narendra Modi. 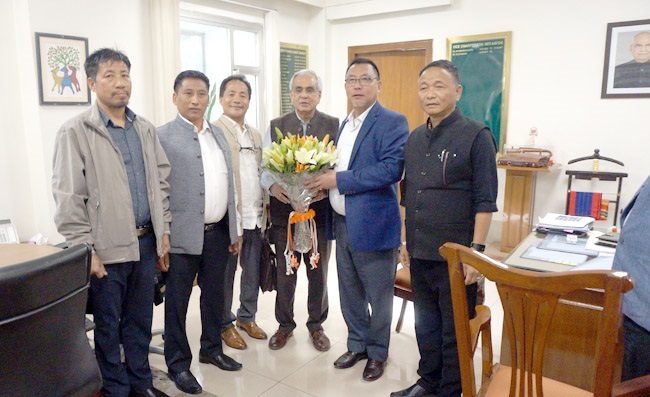 NITI Aayog vice chairman Rajiv Kumar gave the assurance to a delegation of the Eastern Nagaland Legislators’ Union (ENLU) in New Delhi on Friday, a release issued by PRO, Nagaland House, New Delhi, Kuolie Mere said on Saturday. The eastern Nagaland legislators led by minister of health and family welfare S Pangnyu Phom, who is also the convenor of the ENLU, called on Kumar to discuss development issues of eastern Nagaland. The team apprised the NITI Aayog in regard to the Prime Minister’s commitment for development of eastern Nagaland region particularly on education, road connectivity, health, tourism and agriculture and allied sectors. Modi, during a Nagaland Assembly election rally in Tuensang on February 23, said the centre would ensure special focus to develop the backward eastern Nagaland. The ENLU submitted project proposals for specific areas of focus like education, road, health, tourism and agri and allied sectors. Kumar assured to look into the matter with all earnest and take it up as per the feasibility reports from the ministries concerned. He was appreciative of the fact that the ENLU had taken the pains and efforts to bring forth the detailed proposals. The team had also met Union minister of state for home affairs Kiren Rijiju to apprise him on the urgent need to modernise and upgrade the village guards in the state, which is a unique force in its structure and duties as compared to other parts of the country. Rijiju told the ENLU that the proposal of the state government was under serious consideration of the Centre. The people of Eastern Nagaland under the aegis of Eastern Nagaland People’s Organisation (ENPO) have been demanding creation of a separate state of “Frontier Nagaland”, alleging a “’step-motherly” treatment by the successive Nagaland governments of their area for a long time. They say the successive Nagaland governments have failed to bring any economic development in the four districts. The ENPO also held a public rally in its Tuensang headquarters on September 14, reaffirming its demand for a separate state of “Frontier Nagaland”. The ENPO also submitted a memorandum on its demand to the government of India through the then union home minister on December 6, 2010. The demand to bifurcate Nagaland state came in the face of NSCN (Isak-Muivah) preparing for integration of all Naga-inhabited areas of the north eastern states under one administrative unit.